I was on my way home in a cab when I saw a phenomenon in the sky after the sunset. 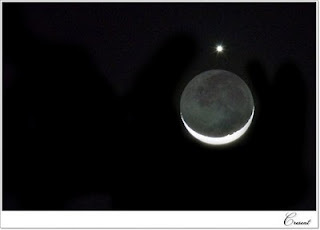 It was the crescent moon and Venus just above it. The view was fascinating in some way and it gives me an unexplained feeling. I wonder if alignment of celestial bodies affects people on how they think, feel and react like what we see in movies or TV shows. I really wanted to take a picture of the moon and Venus after I got home but I know my lens won't be able to capture it. There are really some things you can't take pictures with and you just need to savor the memory of seeing it with your naked eye. When I checked my Facebook, it seems that there many people somehow obsessed with the phenomenon that somebody mistook it as an eclipse. One of my friend was able to capture the moon and the planet with a 300mm lens in his DSLR.